A bitter war of words has erupted among EU states after the failure to reach an agreement on the union's future budget. German Chancellor Gerhard Schroeder blamed UK and Dutch obduracy for one of the EU's "gravest" crises. UK Foreign Secretary Jack Straw expressed sadness, but said the failure could prove a turning point. The EU's current president Jean Claude Juncker said he was ashamed poorer countries had offered to cut their EU income to reach a deal. The summit collapsed after Britain refused to accept a demand by France and some other countries to accept a reduction in its EU rebate. 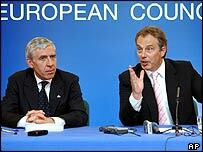 The BBC's correspondent in Brussels, William Horsley, says the recriminations mark perhaps the deepest and most spectacular bust-up ever in the EU. It comes just weeks after voters plunged the union into uncertainty by rejecting its proposed new constitutional treaty. The failure of the talks gave way to verbal sparring, as France, Germany and Luxembourg rounded on fellow member states. French President Jacques Chirac said he deplored Britain's behaviour, adding he was shocked by the "arrogance of several rich countries" in the talks. The UK rejected proposals to limit its annual rebate without a wider reform of the EU's agricultural subsidies. Chancellor Schroeder said the summit failed because of the "totally unaccepting attitude" of Britain and the Netherlands, while Luxembourg Prime Minister and EU President Jean-Claude Juncker spoke of a "profound crisis" in Europe. Britain, however, defended itself against the criticism, saying it was not alone in rejecting the proposed deal. Speaking to the BBC on Saturday, Jack Straw said he was dismayed but optimistic. "It is in many ways a sad day for Europe. But out of this sad day there is an opportunity to reconnect." He said Britain would take the responsibility of leading the debate on the EU's future when it assumes the body's rotating presidency next month, although he conceded the task would be difficult. "This will be seen as something of a turning point for the European Union. Sometimes to secure a turn in democracies, there has to be a shock," he said. As the talks disintegrated, 10 EU newcomers from Eastern Europe offered to cut their funding to salvage a deal, although their call went unheeded. Mr Juncker said that only made matters worse. "When I heard one after the other, all the new member countries, each poorer than the other, say that in the interest of reaching an agreement they would be ready to renounce some of their financial demands, I was ashamed." But Britain said it has the backing of four or five other EU states in its rejection of the budget. UK Prime Minister Tony Blair said the rebate was needed to compensate for the distortions caused by agricultural subsidies, the biggest beneficiary of which is France. Will Luxembourg's "Yes" make any difference? Are you bewildered by EU row?